BiddingOwl.com provides non-profits with auction management tools and helps you acheive your fundraising goals. "Great for small non-for profits "
Pretty simple to use as far as loading all of our silent auction items. Not expensive, meaning that the site doesn't take a huge cut of our earnings. Connecting the account to a payment source was kind of a pain. At no point during the process does it say that once the process is complete, if anything is incorrect, it could take 3-5 days to get it correct. make sure all of your payment info is correct before setting everything up. if it's wrong, there could be delays. "Easy tool for first time auction planners"
This was our first time planning an online auction, so everything, including the BiddingOwl tool, was new to us. BiddingOwl was intuitive and easy to use. The tool prompted us to make decisions about things we hadn't contemplated when we first started planning - minimum prices, escalation increments, and sponsorships. Also inspiring is the screen that shows you the aggregate value of the items you have in the Auction. It also gave us the nudge we needed to get PayPal set up for our Parent Teacher Organization. I wish you could toggle between the manager and the bidder role more easily. BiddingOwl seemed like the best package in terms of functionality and cost. This is our Parent Teacher Organization's first major fundraiser. We don't have a lot of manpower, but BiddingOwl made tracking our items really easy. We are also hoping to tap into resources outside of our immediate community and BiddingOwl's web-based platform will allow us to do that. "Very Great Value and Easy to use"
Their customer service is super helpful and responsive. They really care about their customers and it truly. shows. It was also very easy and simple to use for non technical people like me. I was not the one that set it up but even the person that is the admin that set it up even said the setup was very seamless. I don't like that I can't sort items that I've bid on. Our admin also complained that there isn't a lot of abilities to customize things more. He also stated that the online/offline aspect of the service wasn't flexible enough to accommodate our specific auction set up, and it wasn't very clear how to resolve the disconnect. I feel like we've solved some business issues that we did not have at the moment. We are mainly using this system to sell items from our homes and office to be able to donate to our clients. "Excellent Support Staff. Great Success"
Your help was excellent. I love your product. We will be using it on a annual basis for our November Gala supporting Special Olympics. The support staff was always responsive and answered any questions we had. This was the first time that we had an online auction and it was a great success. We loved the fact that they offered proxy bidding. We really have nothing negative to say. The system was easy to operate and intuitive. Give them a try. They are well worth it. We hold an annual auction and we have used paper bid sheets in the past. This year, we moved to an online format. Our supporters loved it and so did we. The process of organizing the event was much easier for us, since all the information was in one place and organized within BiddingOwl. The bidders enjoyed the online bidding process, particularly the proxy bidding feature. "A cool new way to fund raise!" I've always loved going to live auctions, I love to shop on EBay, and I love a good silent auction. It's just a different take on shopping and you can get some really good deals! Who doesn't love a good deal? I think they could ad some color to the site. It's pretty basic, but other than that, no real complaints. It's really easy to use. It's really fun to use and you have all sorts of things to look at! You can get some great deals too! I work for small company but we help a lot of people, so it's important to reach out to as many as we can when we're trying to help someone raise funds. I'm surprised that we haven't been using sites like this years ago! This site is really easy to use. A lot of the people in my office aren't that tech savvy but they can navigate this with ease. I don't have a lot of negative things to say but I do think the site could use a little more design. It's almost a little too barren. We have a lot of fundraisers for our clients - we work with homeowners that are facing foreclosure. Sometimes a few hundred dollars is the difference between a person keeping or losing their home. Bidding Owl is making it easy to raise funds on an online platform so we can target a larger demographic! "Good for helping our clients!" One of the things that I like best is that you can preset auction preferences so you do not need to enter the same information for all items being Posted. Also, as an admin, the setup and finalization of the auction were seamless. The item management process was pretty tedious. The full list of items I had posted was difficult to sort in any way. I had to keep resorting my item list to find the items I needed to update. Some of the problems I am solving with this software is being able to sell some of our old staging furniture to be able to give back to our clients. "Perfect option for school PTO auction!" We had a wonderful experience with BiddingOwl. We chose this platform because it was very easy and convenient to use as bidders across multiple devices (computers, phones, tablets). We also liked that it wasn't cluttered with advertisements like some other auction platforms. Lastly, it was very affordable, given the high quality. You can only have one manager of the auction, so that person receives all the emails relating to BiddingOwl. In the future, we may set up a specific email account to share across the entire auction committee. We were able to raise a good amount of money for our school PTO in a fun, new way. "This program is just AWESOME"
I am the "IT" coordinator (Please know, I use this term VERY loosely, as I am self taught and really not an IT person at all!) for our small private school here in Wisconsin. I have to tell you - this program is just AWESOME! It has alleviated so much stress from the past 5 years I've worked on our auction. I am so glad I found you! Thank you! I love the paper bid sheets, however, it would be nice to be able to upload our own logo. We needed to find an easier way to manage our auction. Google Docs was not working for us anymore. Biddingowl made everything much easier. "Great change from another platform"
My daughter goes to a private school and I am involved with their annual gala event. In previous years, we have used another product. This year, we decided to change platforms. Boy, are we glad we did! Their phone and email support was the best. They were always available to answer any questions. They also scheduled a volunteer training session for us as well as gave us an emergency phone number for after hours support (which we didn't need to use). Their flat fee of 5% saved us a lot of money and we had our most successful gala in the history of the school. I wish that they would support table seating charts. But it is my understanding that they plan on adding this in the future. If you consider switching, go for it! You will not regret it and will save your organization tons of money. We had a very successful event and Biddingowl helped us raise more money as well as save money. Nothing other than I would have loved to have the option to receive an email or text every time someone bids! 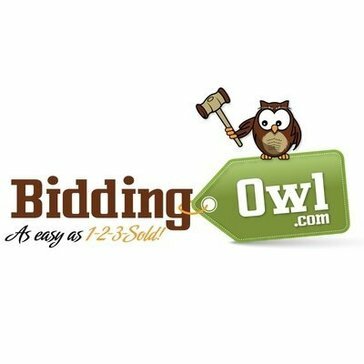 The ease in adding items to your own custom auction and letting BiddingOwl.com do the rest! Everything is very user friendly! I like to keep all sold items in the database of BiddingOwl, but changing the category of each sold item to cash is a manual and repetitive process - I believe could be more efficient. Great software to easily sell assets! We liquidate all of our unused assets company wide through BiddingOwl.com! Our employees and contact love the user interface when bidding on items, and the entire process is streamlined! We love it! "A great way to raise funds!" I like the user interface the best. Gotta keep it simple. I don't dislike the site. I think it's pretty simple and straightforward.... which is good. It can be hard to get users to follow through with technology. Just know that it's easy to use and you can target a larger demographic with this product. We're solving the issue of reaching a good amount of people to raise funds. We can't just have internal auctions because we only have 40ish employees. To really impact our clients we need to take it bigger! "BiddingOwl- Easy, Inexpensive and great customer service!" Setting up our auction was really easy and customer support was so helpful! They are very responsive and get back to you right away. I had never done an auction before but it was so simple. Nothing! Once everything is listed it's just as simple as sharing the web address. I strongly recommend Bidding Owl. We haven't had any issues with Bidding Owl. We have done four auctions with them and raised thousands of dollars for our school that we would not have had without it. We are able to generate money from outside our school community by sharing the link with family, friends and neighbors. "Simple Implementation, Deep Feature Set"
Ease-of-use, from account creation through addition of auction items. Secondary functionality like tickets and volunteer management. A couple of SQL errors on implementation, handled promptly by customer support. The combination of a stout list of features as well as the general simplicity of implementation made BiddingOwl a no-brainer. I run a non-profit in its first year of fundraising, and the batch of tools BiddingOwl offered would have cost us thousands of dollars with another service. Online auction functionalist without the massive cost outlay of other services allow our young non-profit to thrive in our first full year. "Outstanding customer service, tech support"
It is very easy to use. I was set up in no time. A little time consuming but I think it has to be to be so personalized. We are holding an auction for a non profit. This is our second year. It was very easy to enter bids. We heards no complaints from any of the bidders. It would have been nice to include a photo of the auction items. Fundraising for a school program. * We monitor all BiddingOwl.com reviews to prevent fraudulent reviews and keep review quality high. We do not post reviews by company employees or direct competitors. Validated reviews require the user to submit a screenshot of the product containing their user ID, in order to verify a user is an actual user of the product. Hi there! Are you looking to implement a solution like BiddingOwl.com?